Celebrate the Lunar New Year with this sweet gift box featuring Lucky candies, pineapple cakes, Hagensborg truffle pig chocolates, Rich Dusted truffles and Bischoff cookies. 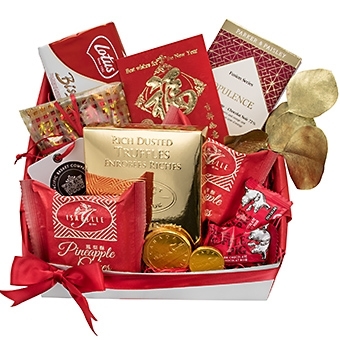 The Prosperity gift basket also includes red envelopes with chocolate coins. The Prosperity gift box is beautifully wrapped a hand tied satin ribbon and includes a gift card with your message. All gift baskets on www.pacificbasketco.com are exclusively designed and made by Pacific Basket Company.